What is the reciprocal of a fraction? Before we can perform division of fractions, we need to first understand the concept of reciprocals. How to divide by a fraction? To divide a number by a fraction, we multiply the number by the reciprocal of the fraction. In other words, when you change the operation from ÷ to ×, you need to change the second fraction to its reciprocal. 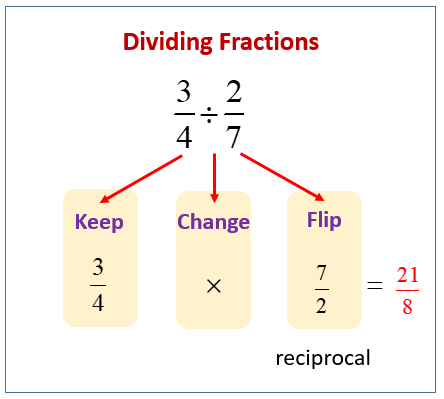 The following diagram gives an example of dividing fractions using reciprocal. Scroll down the page for more examples and solutions.